On June 17th the annual BIG BOW Museum Excursion will take place. 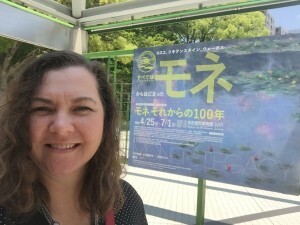 This time we will go to the Monet exhibit at the Nagoya City Art Museum. Almost ten years ago, the BIG BOW students went to a Monet exhibit at the Boston museum, but that exhibit focused on his life and how he was influenced by Japanese woodblock prints. This one is about how Monet's art influenced other artists years later, even modern artists (Mark Rothko) and pop artists (Andy Warhol). I was surprised to see that so many Japanese modern artists were also influenced by him. Seth, the assistant teacher, and I spent two hours at the museum this morning, going through the exhibition and taking notes for the excursion worksheets and BIG BOW class lesson on Monet. It was wonderful and we're really looking forward to the event on the 17th!